by dehydrating insects and not chemically like other pesticides. as see it in action. RATE OF APPLICATION:    1 lb covers up to 800 sq/ft. 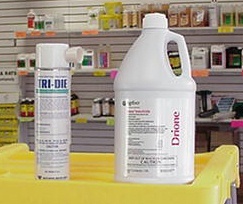 Most jobs will need the bulk packaging or loose Drione. treatments. Use a Hand Duster to get a good application. Cannot be shipped to Alaska. 1/2 the price of Drione, may be better suited for small jobs. their exoskeleton which leads to a lethal loss of vital moisture. This unique formulation will last over a year in treated voids. Dust is like and why it can be used as a substitute for Drione.